For the last five years I have been creating walking illusion costumes and this year, I did it again. 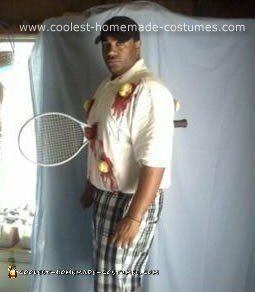 I created the “Wrecked Tennis Player”. The best thing of this costume, was that it wasn’t heavy and bulky like the ones that I have made before. I took an old tennis racket that I had and sawed it in half, used wire-hangers to hold them in place so that they can hang on my shoulders. After I had the right measurements to center them on my body I put the racket on a polo shirt. I used a blade to cut the balls in half and them stuck them with the best glue in the world Crazy Glue. The best part was decorating around the tennis balls and racket with school glue, cotton balls and some fake blood that I made with corn syrup, dish liquid, corn starch and red and blue food coloring. This year I did not compete, but I had a blast with this costume. Wherever I went that night, I was the center of attraction. Wow amazing and very clever idea. The good thing about it is that is looks realistic. Nice job on making the racket so straight. Hi5 on this one!! I love it! I made it for Halloween, it turned out to be amazing, i added a couple new features but used mostly your ideas! Thanks! Hey thanks for the comment am glad u like it . This costume is fantastic!! I am very impressed and thinking of doing something similar for Halloween this year. I was just wondering you could expand on exactly how you managed to secure the racket through the chest as I cannot see how it does not sag downwards.